MC-550 shown above with lid installed. 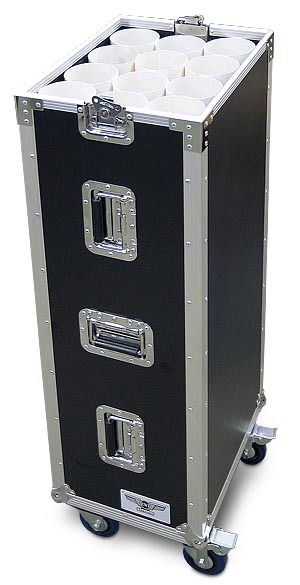 This is the EWI Tourcase tm Model MC-550 microphone stand case. The side panels are constructed with 3/8 inch hardwood plywood and covered with a black ABS laminate surface. The extrusion is all aluminum and assembled with aluminum rivets. 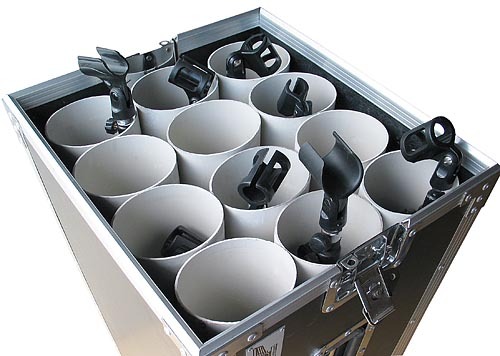 Padded flip handles, 6 total, are arranged both vertically and horizontally on both sides to allow lifting of the case from any orientation and are backed with washers to ensure strength and durability. The removable cover (lid) is held closed with 2 recessed butterfly latches. The MC-550 is equipped with four 4" swivel casters, two of which are locking style. The casters mount to a 3/4" plywood caster board. Front to back: 13 3/8"
Total inside height: 42 3/4"
Height: 50 1/8" measured on casters. Dimensional shipping weight: 104 lbs.